Timers can be put to good use in maintaining pace in lessons, helping students keep focused and encouraging time management and there are many timers that can be put to good use using data projectors / IWBs. There are also articles on the web which talk about how timers can be utilised in the classroom, for example this one on using timers to improve student learning and behaviour. This simple flash based timer provides a clear timer with a selection of different soundtracks – including Doctor Who! The Fiery Ideas website has many fantastic ideas, as well as producing commerical resources, they have several great freebies on their website and it is well worth exploring! This excellent balloon timer, builds anticipation amongst students as the balloon gets bigger and bigger, can they can complete the work before the pin bursts the balloon??! There are up to 7 different types of music and times for up to 20 minutes. 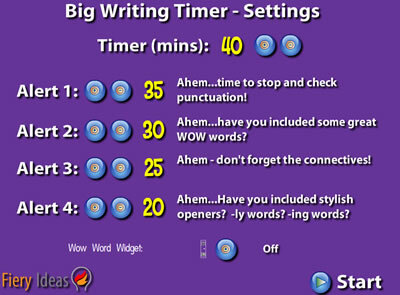 The Fiery Ideas site also has this useful “Big Writing Timer” enabling you to set times to encourage students to keep pace and focused as well as reminding them of various aspects required in their written work. This useful flash based timer allows you to control the timer, from seconds up to hours! You can choose to display either the timer or clock version, or both! You can select from a series of sounds to mark the point at which the timer reaches zero! One of my favourite timers which I use alot in the classroom is this timer from Sandfield’s Comprehensive school. You can use the timer from the site, however the quality and flexibility is better if you download it to your computer. You have a variety of sounds to choose from (or you can choose to have it silent). You can also add your own soundtracks if you wish – for example I have one to the tune of “Under Pressure” (It is also worth looking at their games site for other interactive resources, including Who wants to be a Millionaire, Blockbusters etc!). I also suggest trying http://ipadstopwatch.com it has a large display that makes it perfect for classrooms and it’s very easy to use.